PLANTSVILLE CT. — Notre Dame football legend, Daniel “Rudy” Ruettiger, will be the featured speaker at The Summit At Plantsville, a skill nursing facility that offers both short-term rehabilitation and long term care. The event entitled “Rudy” will take place on April 4 at 7:00 p.m. Tickets for the event are $35 in advance and $45 at the door. 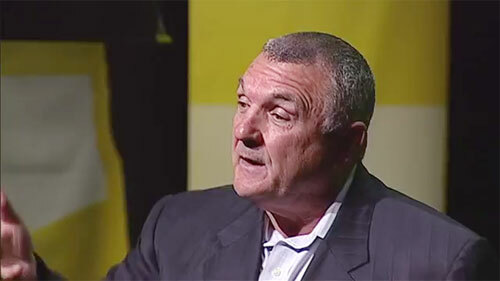 Photo shows Notre Dame football legend, Daniel ‘Rudy’ Reuttiger, speaking in March 2013 at Chicago Ideas Week, an annual seven-day celebration of ideas, innovation and community. Ruettiger’s speech will recognize each individuals commitment to fulfill the dream of recovering from their ailments and working hard in their pursuit to make their dream of recovery a reality. As the ultimate underdog story, Daniel “Rudy” Ruettiger carved his name into history in twenty-seven seconds as perhaps the most famous graduate of the University of Notre Dame. From football champion to founder of the Rudy Foundation, Rudy explores the importance of passion, determination and heart. Ruettiger is best known as the inspiration for the 1993 motion picture “Rudy”, which starred actor Sean Astin in the title role as Rudy. He is also rememberd for sacking Georgia Tech quarterback Rudy Allen and as being the last Notre Dame football player to be carried off the field during a team home game. If you would like to book sports speakers like Rudy Ruettiger for a speaking engagement, autograph signing, guest appearance, endorsement, VIP meet & greet or special event, contact Rudy Ruettiger’s agent for appearance & speaker fees.